Financial Crisis a Crime Story? “Did the current economic crisis result simply from market forces, misjudgment and greed? Or was it a deliberate criminal manipulation of markets to extract wealth from the masses? 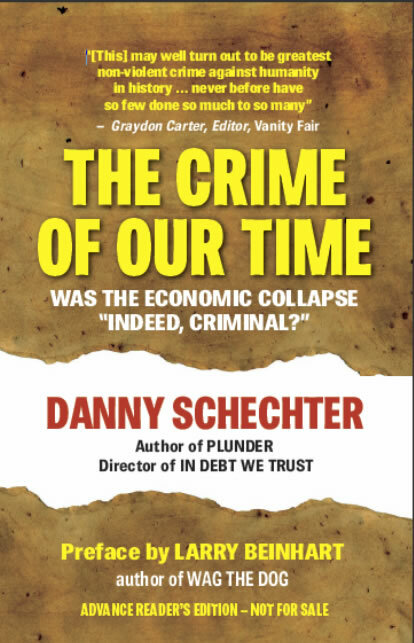 In The Crime of Our Time, Danny Schechter turns his polished investigative and reporting skills to exploring the theory that it was a crime. In veteran journalist prose, he establishes the crime’s elements, identifies the players, and exposes the weapons that have turned free markets into vehicles for mass manipulation and control. – Ellen Brown, a Los Angeles area-based attorney, is the author of Web of Debt and other books and articles on economic issues. “Danny ranges wide over the political and cultural landscape, pointing fingers, naming names and holding no sacred cows in his quest to determine what went wrong with our economy and who was responsible. His work is the antidote to to a biased, compromised and sclerotic mainstream media.” – Aaron Krowne, editor of Ml-implode and related websites on the mortgage and banking crisis.